General Secretary Xi Jinping emphasized in the 19th CPC National Congress to “deepen the reform of state-owned enterprises, develop a mixed-ownership economy, and cultivate world-class companies that are globally competitive.” It is necessary to speed up the establishment of an effective and balanced corporate governance structure, and a flexible and efficient market-based operating mechanism. In addition, property rights and operating autonomy of enterprise legal persons shall be implemented in accordance with the law. 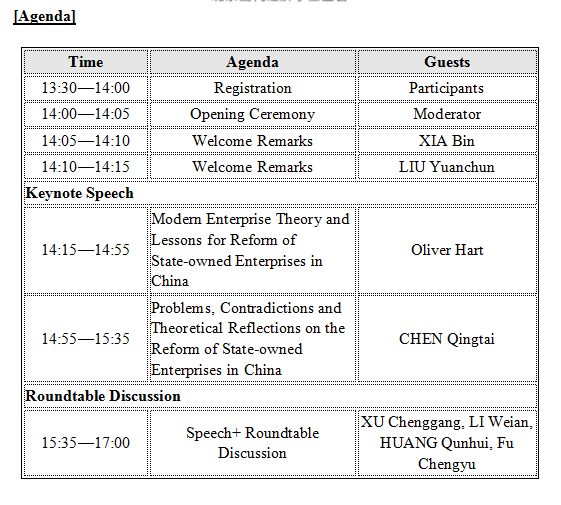 National Economics Foundation, together with Renmin University, holds the Fourth Great Minds China Forum, themed by The Theory of the Firm and SOE Reform in China to explore modern enterprise theories, harness and promote the institutional construction of modern state-owned enterprise in China. It is hoped that ideas generated in this forum will have a profound impact on deepening the reform of state-owned enterprises in China and fostering world-class companies with global competitiveness. What kind of companies should be merged? How to view the merger and acquisition of Chinese state-owned enterprises from the theory of property? Where are optimal boundaries of state-owned enterprises? How to match company’s control rights and income rights? How to prevent managers who have control rights from stealing corporates’ income? How to better deal with the issue of incentives for managers of state-owned enterprises in China? How to solve the free-rider problems that may exist among creditors in the bankruptcy of a company and the waste of the value of corporate assets? How do you view the two rounds of debt-for-equity swap of state-owned enterprises? Counselor of the State Council, director of National Economics Foundation, honorary head of the Research Institute of Finance, Development Research Center of the State Council, chairman of China Chief Economist Forum, and member of Chinese Economists 50 Forum. Associate Dean of the School of Economics, director of the Department of International Economics, and joint director of the Economic Research Institute in Renmin University of China, associate dean of the China Institute for Reform and Development, review expert of the Ministry of Education for Returned Overseas Students’ Scientific Research Start-up Fund, and review expert of National Social Science Foundation of China. Oliver Hart is currently the Andrew E. Furer Professor of Economics at Harvard University. Hart works mainly on contract theory, the theory of the firm, corporate finance, and law and economics. He is the 2016 co-recipient of the Sveriges Riksbank Prize in Economic Sciences in Memory of Alfred Nobel. Former party secretary and deputy director of the Development Research Center of the State Council. Member of the CPPCC Standing Committee, vice director of the Economic Affairs Committee. Senior engineer, research fellow. Mainly engaged in macroeconomics and industrial economy. Former president of Tianjin University of Finance and Economics, professor of economics. He once served as the dean of Business School of Nankai University, director of Modern Management Institute, director of MBA Center of Nankai University, Director of Center for Studies of Corporate Governance of Nankai University, and editor-in-chief of Nankai Business Review. Director, research fellow, doctoral supervisor of Institute of Industrial Economics, Chinese Academy of Social Sciences, executive vice chairman of the Chinese Institute of Business Administration, and deputy director of the Management Science Research Center of the Chinese Academy of Social Sciences. Senior Economist, former president and board director of CNOOC, Party Secretary and board director of Sinopec. Man of the Year for China Economy by CCTV in 2005. Director of UN Global Compact .